The Article: Charity is not a substitute for justice by Sarah Kendzior in Al-Jazeera. The Text: On November 15, thousands of people in San Francisco worked together to make an ailing child’s wish come true. Miles Scott, a five-year-old boy recovering from leukaemia, dreamed of becoming “Batkid”. At the behest of the Make-a-Wish Foundation, a charity which grants the wishes of children with life-threatening illnesses, San Franciscans staged an elaborate series of events for Scott and his family. He rode in the Batmobile, rescued a damsel in distress, and received national press coverage and a personal message from President Barack Obama. The public effort for Scott shows what a difference kindness and compassion can make for a family in need. But one of the reasons the Batkid outreach was so moving is that it is such a rare occurrence. In an era where bad luck is mistaken for bad character, the plight of those worse off tends to be ignored or portrayed as a perverse form of retribution. Poverty becomes both a crime and its own punishment, even for children. In many US schools, a child who cannot come up with lunch money is expected to go hungry. In Texas, a 12-year-old’s lunch was thrown in the trash because he could not come up with 30 cents. The outreach for Batkid was celebrated as a triumph of the human spirit. But what it demonstrated is how much better society could be if generosity were consistently applied towards all, instead of concentrated into brief celebratory affairs. “Charity is no substitute for justice withheld,” Saint Augustine once declared. This is painfully clear in San Francisco and its surrounding area, home to some of the highest income inequality in the country. 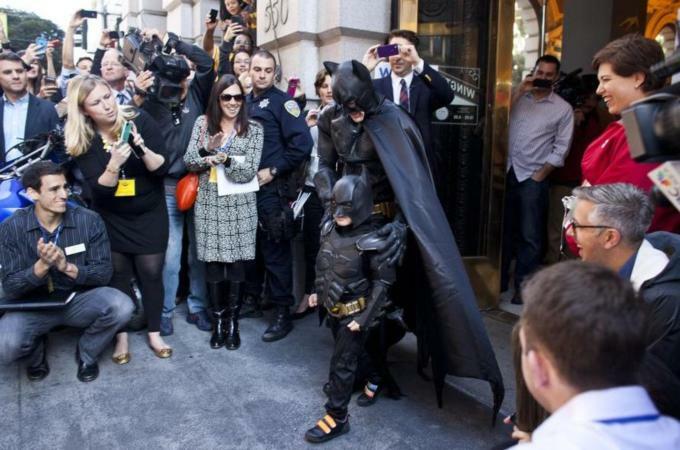 As journalist Alyssa Rosenberg argues, Batkid was supported by the tech community, who saw the event as a way to indulge in their own superhero fantasies. Yet the broader message of the tech community is that most children do not deserve to be saved. Silicon Valley is a region of “masters and servants”, where homelessness has increased 8 percent, as salaries skyrocket. A proposal for Silicon Valley to secede and therefore deny taxpayer money to social programmes benefiting low-income residents, including children, was met by many with approval. Charity, as a supplement to justice, should be applauded. But charity as a substitute for justice is neither charity nor justice. It is cruelty. The same week that the nation cheered a charitable effort to make one child’s wish come true, the largest employer in the US held a charity drive for some of its own workers. Wal-Mart, whose six heirs to the company fortune have as much wealth as the bottom 42 percent of Americans, pays its workers salaries so low that many qualify for food stamps. The costs are then transferred to taxpayers. A report by the House Committee on Education and the Workforce estimated that one Wal-Mart Supercenter employing 300 workers could cost taxpayers at least $904,000 annually. Yet instead of raising salaries to allow employees to live above the dole, Wal-Mart encourages charity – a common panacea to social plight. Universities employing adjunct professors, who are also paid below poverty wages, have held similar food drives for their employees. In September, Margaret Mary Vojtko, a Duquesne University professor, who had worked at the school for 25 years, died in abject poverty with an annual salary of less than $10,000. Responding to accusations of callousness, Duquesne noted that they had offered Vojtko charity, such as an offer to fix her furnace. A Slate article promising the “real story” of Vojtko argued that she brought her troubles upon herself by refusing Duquesne’s gifts while working with a growing movement of adjuncts attempting to unionise. In other words, Vojtko refused charity while pursuing justice. This is not a position to condemn. Fiscal stability that relies on gifts is not stability. It is a guarantee of insecurity: income based not on work but on whim. Capricious generosity is not a replacement for a living wage, nor is it a basis for a functioning society. Charity is no substitute for justice. In rural Missouri, there is a store called Nick’s Gun and Pawn. Locals can trade their weapons for household items, or vice versa. It is one of many examples of one of the most overlooked stories in the great recession: the explosion of pawn shops and payday loan outlets throughout the US. Between 2009 and 2011, the rate of Americans using high-cost nonbank credit soared to 14 percent, and included a rise in population segments once considered economically advantaged, but now unable to afford daily needs. Pawn shops and payday loans are the flip side of the US’ turn to charity over justice. Both phenomena speak to a seemingly permanent impermanence: The replacement of a reliable salary for hard work, with high-cost gambles and unpredictable donations. In much of the US, possessions are not things you own. They are disaster protection, what you trade to survive. The consequences are not only material but psychological. When you are constantly gambling, the future comes to look like a bad bet. Journalist Gillian Tett notes that poorer Americans, living check to check, are “more likely to perceive the future as a chaotic series of short-term cycles”. When people are expected to work unpaid for the promise of work, the advantage goes to those immune from the hustle: the owners over the renters, the salaried over the contingent. Attempts to ensure stability and independence for citizens – such as affordable healthcare – are decried as government “charity” while corporate charity is proffered as a substitute for a living wage. “Taking what you can get” is also the path pursued by corporations and people who prefer cheap acts of charity to long-term investments in justice. It is a path that encourages citizens to depend on arbitrary generosity while decrying stable programmes that help people through tough times. It trades in racial stereotypes, portraying the poor as lazy, violent and “undeserving” of either assistance or the benefit of the doubt. On November 23, East Saint Louis, an impoverished city with a high rate of gun violence, offered a trade to city residents: bring in your gun and receive a $100 gift certificate at a local grocery store. At 9 am, a long line had formed of residents with guns in hands. Within ten minutes, $10,000 of grocery store gift cards had been given away. Some were surprised by the outcome. They should not have been. Ours is an economy of survival. Violence is often the last resort for people out of options. When presented with options, they chose food. Charity, for the giver, is the trade of cash for a moral fix. As the Make-a-Wish showed, charity can be beautiful. But it is an investment in the present, not the future. If you value the future – if you value a society where people can imagine their future – work for justice.